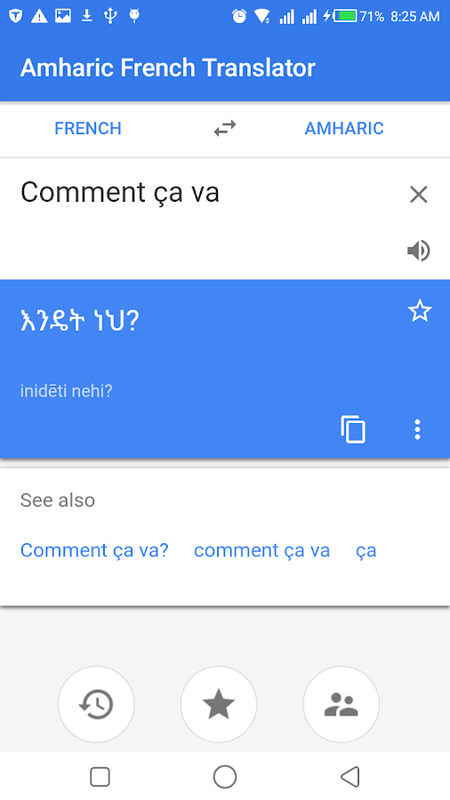 Translate from Amharic to French and to variouslanguages.Translatefrom French to Amharic and other variouslanguages.Learn to readAmharic and french.Learn to PronounceFrench.Share translation toothers.Save Translation.Accesstranslation history.Fast andaccurate translation system. Free Malay English Translator Translate text, word or sentence fromMalay to English or from English to Malay language. You can usethis apps as a Malay to English dictionary or English to MalayDictionary too. Uses of Malay English Translator are following: -Malay English Translator - English Malay Translator - Simple UserInterface(Easy to use for Translator) - Listen translated text,sentence in English or Malay - Used as a Malay to Englishdictionary or English to Malay Dictionary. - Social Media - Easilyshare with Friends and Family. Learning Malay or visiting a Malay speaking country like Indonesia,Malaysia and Brunei? Ease your learning/communication bytranslating any English or any other language word/sentence toMalay. Translate any Malay word/sentence to English also. Chat inMalay even if you don't know it. Share via SMS, Whatsapp, Viber orany other messaging platform. Ideal for students, tourists orlinguists. Dict Box - English to Thai & Thai to English dictionary &translator. No internet connection required. Fast, convenient &easy to use. Very smart word suggestions. All dictionaries in oneplace. Just tap the word to see its meanings. Translate textdirectly in the web browser and other apps. Text pronunciation.Picture dictionary. Word reminder. Plenty of dictionaries availableto install. And a lot more useful features.